This picture is of Gail and Jessica who have been regulars at our weekly meditation for at least 3 years. We don’t spend much time together, just a half and hour a week and 20 minutes of that has been in silence yet I would call these two soul sisters. Meditation with others is a very powerful practice. I meditate daily on my own and can’t imagine life without that practice yet there is something different about sitting in silence with others. The intentional coming together with others is like saying for this brief time we claim nothing to do, nowhere to go and recognize life is bigger than our thoughts. I have heard that the act of gathering in silence with other can literally change the world. In some ways it is a mini protest to the fullness of thought and doing. 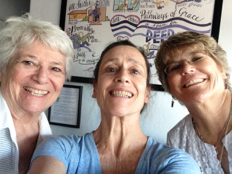 Gathering with Jessica and Gail and others who have coming to meditation over these past years has impacted my sense of connectedness with all of humanity. That brief half hour each week, even with miss Grace my Boston Terrier snoring in the background has created a bound that is beyond words. In sitting in the simplicity of silence and the challenge of silence together we can leave our time together knowing we have touched a Love much greater than ourselves and at the time allowed the Love to enter into our own lives. Please feel free to join us on Tuesday at 5pm.